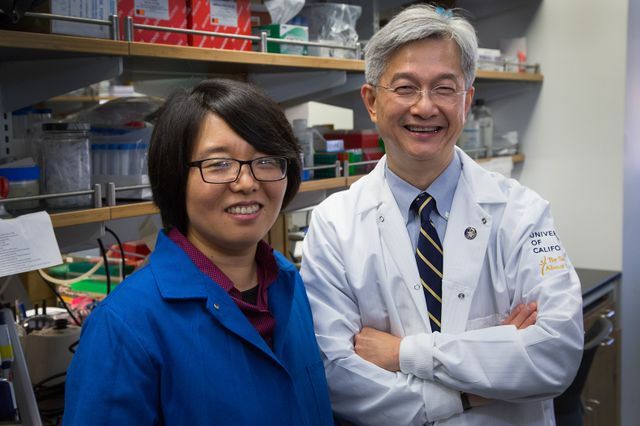 UCLA research could lead to a simple saliva test capable of diagnosing — at an early stage — diabetes and cancer, and perhaps neurological disorders and autoimmune diseases. The study, the most comprehensive analysis ever conducted of RNA molecules in human saliva, demonstrates that saliva contains many of the same disease-revealing molecules that are contained in blood. It was published online today by the peer-reviewed journal Clinical Chemistry and was published Clinical Chemistry’s January 2015 special print issue, “Molecular Diagnostics: A Revolution in Progress.” “If we can define the boundaries of molecular targets in saliva, then we can ask what the constituents in saliva are that can mark someone who has pre-diabetes or the early stages of oral cancer or pancreatic cancer — and we can utilize this knowledge for personalized medicine,” said Dr. David Wong, a senior author of the research and UCLA’s Felix and Mildred Yip Endowed Professor in Dentistry. Dr. Wong said the test also holds promise for diagnosing Type 2 diabetes, gastric cancer, and other diseases. “If you don’t look in saliva, you may miss important indicators of disease,” Dr. Wong said. “There seems to be treasure in saliva, which will surprise people.” RNA, widely known as a cellular messenger that makes proteins and carries out DNA’s instructions to other parts of the cell, is now understood to perform sophisticated chemical reactions and is believed to perform an extraordinary number of other functions, at least some of which are unknown. Dr. Wong’s research over the past decade has focused on identifying biomarkers in saliva. Dental researcher Dr. Pushpa Pandiyan (photo) and colleagues have discovered a new way to model how infection-fighting T-cells cause inflammation in mice. The hope is that the discovery will lead to new therapies and/or drugs that jump-start weakened or poorly functioning immune systems, said Dr. Pandiyan, an Assistant Professor at Case Western Reserve University (CWRU) School of Dental Medicine. Dr. Pandiyan believes the process could lead to identifying and testing new drugs to replace anti-fungal medicines that have become ineffective as the fungi develop a resistance to them. Dr. Pandiyan's findings are explained and demonstrated in the Journal of Visualized Experiments (JoVE) article "Th17 Inflammation Model of Oropharyngeal Candidiasis in Immunodeficient Mice," published online on February 18, 2015. The research advances Dr. Pandiyan's previous work on isolating different types of oral T-cells for study. T-cells are a type of white blood cell that is critical to the body's immune system. In the newest research, she used T-cells and injected them into mice genetically engineered to have no immunity in order to test how the cells function when fighting a common thrush-like yeast infection found in the mouth, called Candida albicans. When the infection-fighting cells are not controlled properly, they caused inflammation. According to Dr. Pandiyan, approximately 60 percent of the population has the fungus, but a healthy immune system keeps it under control. In humans with weak immune systems, the fungal growth appears as a white coating on the tongue. Individuals with the infection report a painful burning sensation in the mouth. As the infection spreads, it causes inflammation of the mouth area, tongue, and gums. Left untreated, it can spread to the throat and the esophagus. Researchers at the Medical College of Wisconsin (MCW) have linked a specific protein to the development of post-viral infection asthma, which is the first step in generating a novel type of asthma therapy designed to prevent development of post-viral asthma in young children. The findings were published in the February 13, 2015 issue of the Journal of Biological Chemistry. The article was titled “Structure-Function Analysis of CCL28 in the Development of Post-Viral Asthma. Brian F. Volkman, Ph.D., Professor of Biochemistry; and Mitchell H. Grayson, M.D., Associate Professor of Allergy and Immunology; are the lead researchers on the study. Asthma is a chronic disease of the airways that affects more than 300 million people worldwide. It is the number-one illness leading to school absences in children, and accounts for more than 1.8 million emergency room visits annually. There is no cure; all current therapies focus on providing symptomatic relief, and reducing the number and severity of attacks. "Understanding the molecular mechanisms by which asthma develops and establishes itself as a chronic disease is key to elucidating alternative and potentially curative therapies," said Dr. Grayson. The researchers had previously found evidence linking a human chemokine (protein) called CCL28 (http://en.wikipedia.org/wiki/CCL28) to the development of chronic asthma. This study is the first, however, that examines structural analysis and its impact on disease development. "We found that even in the absence of a viral infection, CCL28 can play a role in the induction of asthma pathology--when the protein is natively folded. If unfolded, it does not," explained Dr. Volkman. "We propose that by exploiting the unique structural features of CCL28, potent and specific CCL28 inhibitors may be developed. Bacteria may not have brains, but they do have memories, at least when it comes to viruses that attack them. Many bacteria have a molecular immune system that allows these microbes to capture and retain pieces of viral DNA that they have encountered in the past, in order to recognize and destroy that viral DNA when it shows up again. Research at Rockefeller University, published online on February 18, 2015 in Nature, offers new insight into the mysterious process by which this system works to encode viral DNA in a microbe's genome for later use as guides for virus-cutting enzymes. The title of the Nature article is "Cas9 Specifies Functional Viral Targets during CRISPR–Cas Adaptation." "Microbes, like vertebrates, have immune systems capable of adapting to new threats. Cas9, one enzyme employed by these systems, uses immunological memories to guide cuts to viral genetic code. However, very little is known about how these memories are acquired in the first place," says Assistant Professor Luciano Marraffini, head of the Laboratory of Bacteriology at Rockefeller. "Our work shows that Cas9 also directs the formation of these memories among certain bacteria." These memories are embedded in the bacterial equivalent of an adaptive immune system capable of discerning helpful from harmful viruses. This is called the CRISPR (clustered regularly interspaced short palindromic repeats) system. It works by altering the bacterium's genome, adding short viral sequences called spacers in between the repeating DNA sequences. These spacers form the memories of past invaders. They serve as guides for enzymes encoded by CRISPR-associated genes (Cas), which seek out and destroy those same viruses should they attempt to infect the bacterium again.